At every turn along the winding, narrow roads across the moors of Southern Cornwall in June, there were wildflowers in abundance. Sometimes, they grew so prolifically that they swept along each side of the car as we passed by. With little traffic, we were able to stop often and enjoy their rain drenched beauty. The effect of raindrops on foxgloves, Digitalis purpurea, is just stunning. Spring had come late to Cornwall, so bluebells were still in flower. These native bluebells, Hyacinthoides non-scripta, are often seen in Spring in the UK in woodlands, hedges and other shady places. These are not the same as the blue bells grown in gardens, Spanish bluebells, Hyacinthoides hispanica, although those can be found in the countryside when careless people dump them. Buttercups were everywhere bringing a touch of sunshine even on dull days. The most common of all roadside flowers are the fluffy white heads of cow-parsley, Anthriscus sylvestris. This member of the umbelifferous carrot family is also known as Wild Chervil, Wild Beaked Parsley and Queen Anne’s Lace. Our wanderings brought us back out to the coast road at the tiny village of Zennor, on the coast not far north of Levant mine. Here we found an excellent place for lunch; a back packer’s hostel with freshly made food. Next door is the Wayside Museum; a very good, small, family run museum that has over 5,000 artefacts dating from the Bronze Age to the 1950s. Items are well displayed with good descriptions to help the visitor understand something of life over the centuries along this southern Cornish Coast. The museum contains Trewey Mill, restored and working again after 150 years of neglect. On certain days of the year this Corn Mill still grinds wheat and oats – not, unfortunately, on the day we were there. In UK wheat is known as corn and that can be somewhat confusing to those of us from Australia. If you remember poetry and prose from your school days about waving corn… think wheat! And those corn dollies were made of wheat or oats. Before the advent of the corn mill, meal was ground from grain using these querns (above). Hard work for small results but then not too many people could afford great quantities of grain. The museum is housed in the buildings of a 16th Century Miller’s cottage. People were much shorter in stature in those days judging by this door. It was indeed low! The single storey house with a thatched roof, was built in 1513, in the reign of King Henry VIII. It housed the family who worked the mill which at that time was a ‘fulling mill’ for making cloth. When the mill changed to grinding flour is not known but two of the old grinding stones have been used in the floor of the kitchen (just inside this door). These stones went past their use by date as mill stones but found a new use as flooring. They have been part of this floor for over 200 years and show barely a sign of wear. Modern flooring doesn’t last quite so long. Dried furze or gorse, of which there’s an abundant supply on the moors, was put into the oven and lit. When white hot, the furze would be pulled out – carefully one would hope. Maybe the stone floor was an advantage! The food to be baked was placed in the oven, a door placed in front and the cooking process occurred using latent heat. I grew up learning to cook on a wood fuel stove so I knew something of the vagaries of this method of cooking. Now, when cooking in a cloam oven, it was quite likely that the bread would burn on the bottom. A file or rasp was used to grate off the blackened bits. When serving bread, it was always polite to give the top piece to those socially ‘above you’ and from that we get the English expression, “Upper Crust”. The bottom piece, with the blackened bits filed off, would be given to your own family. And, I suspect from my reading that, within the family, the upper crust usually went to the husband with the bottom bits to the children and wife. There were, and always are, hierarchies in any society. One of the items in this museum that fascinated and horrified me was this man trap. These were used by land owners in the 18th and 19th centuries to discourage poachers. The penalty for being caught in one of these was not just a very sore leg. The culprit would be deported to the colonies, usually for life, or sentenced to death by hanging, and that was usually an event for witnessed by large local crowds. It was quite an event. Others went to the colony of Australia more willingly, lured by the prospect of free passage and work when they got there. We came across many such posters in small museums in Cornwall. Transportation to Australia of so many young men to the colonies had left several ‘holes’ in the demographics of those developing communities. They were short of marriageable single women, skilled young workers and families who would add a sense of community to the growing colonies. A great many Australians have forbears who answered this call to emigrate, not just from Cornwall but from other parts of England, Scotland and Ireland; many of David’s family among them. 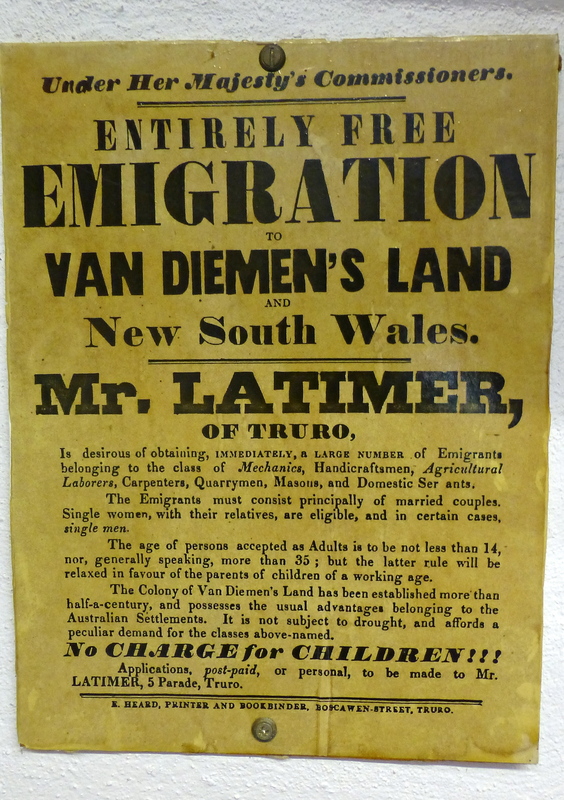 Poor living conditions in the UK at that time were the ‘push factor’ for emigration and posters like these provided a very strong ‘pull factor’. No one readily leaves their home, their family and their country forever without both of these factors being strong. And when people did emigrate, it was usually for life. Their only contact with families was by post and those letters often took months to be delivered. When it was time to leave the museum, we drove on across the moors along narrow roads that were once just tracks walked by the postmen and women of the moors who brought just such letters and parcels in all weathers and all seasons to the isolated hamlets and farms of the moors. From notes at the museum we learned that some of these people were easy going, like Postman Bryant, who would stop for a cup of tea and a chat in various houses and even visit the pub on the way. He would, no doubt, relay the gossip and the news that had come from across the other side of the world. Others, like Postman Renowden, was a crotchety old thing nicknamed Mr Grumps. He waited for no-one. He was often helped by Willy Spry, a very small chap with a peaked cap and turned out feet. Willy was always tied to a lead and led along by Mr Grumps so that he would not lag behind! But it wasn’t just men who carried the post. There are many stories of post women like Old Mrs Kitty White, Mrs Whelan and Annie Christopher, the latter a ‘grand old soul’ and a great story teller who wore long black skirts and hob nailed boots to walk many miles a day with the post. It’s the stories of individuals like these who make the history of any place come to life. We were very thankful that some of the stories of the Cornish coast have been recorded before they are lost forever. Today, not many people walk these roads, still fewer ride horses or drive pony traps. It’s cars, vans and sometimes trucks that drive across these moorland roads now and they were never really meant for vehicles. Driving here becomes even more challenging when the hedges become higher. Wondering what might be coming around the corners can be fun. We even met the local garbage truck on one of these roads. Lots of backing up! But everyone is patient and considerate and it’s never a real problem. And eventually you do come out onto a wider road that leads to a town. From here, we turned east to visit coastal towns on the other side of the southern Cornish peninsular; Penzance, Newlyn and the improbably named Mousehole – places where some of David’s forbears had also lived.